I'm not sure I can call it the perfect breakfast, but this morning I had my first 20/20 experience at Apte, 538-540 Heidleberg Road, Alphington, Tel +61 3 9482 2991. Excellent eggs. Equally great extras. Fantastic fritters. Schmick venue. Smooth service. No mistakes. Schwing! Perfection, I fear, is an elusive beast. Jessica Alba may be 2007's sexiest, but is she the perfect woman? Derek Zoolander may have been born with perfect bone structure, but is he the perfect man? Robert Parker may have scored the 1986 Romanee Conti Montrachet 100 points, but is it the perfect wine? No, no and no. So please don't get hung up on the whole perfect score thing. Just enjoy a truly delicious corn, pea and feta fritter, drizzled with dill-infused sour cream and topped with a mountain of Tasmania's finest smoked salmon (and some nice, ripe avocado). Or tuck into a beautifully balanced big breakfast, with eggs, bangers, bacon and house-made relish, plus mushies, spinach, tomato and organic toast. Or go sweet with toasted, house made banana and coconut bread (with honey labna, pistachios and roasted seasonal fruit). Yum, yum and yum. Wow! Congratulations on locating the first 20/20. Great to see my favourite local eatery finally reviewed, and with an impressive score too! Rarely a day goes by that I am not at least in there for coffee, I wonder if I saw you on Saturday. I highly recommend the BLAT (bacon, lettuce, avocado and tomato on a turkish pide), it got an excellent write-up in the Age recently too. Apte is an oasis in a cafe desert. Superb coffee, great attention to detail, amiable service, excellent quality produce and ingredients. Decor is relaxed and easy going. It always has been 'my' 20/20 . Also great artworks rotate on a monthly basis - which adds to the warm ambience. There are some great photos hanging this month. So yummy! Kee p the good work. Merry Christmas! Their banana bread makes me sing out loud. It's just stunning. All the options I tried on the menu were winners. I (and others) don't like the fact that it's located right on the road - most noticeable in these summer months when you're sitting outside. great site!! please come out to williamsburg brooklyn, NY and rate some of the great brunch places we have! Their sister cafe 'Liar Liar' in Hawthorn is very special also - same great coffee and staff that move between Apte and Liar Liar. Sigh, this is torture. Eggs are not Marrakech's forte I am afraid. could you plz let me know how to get this place? i really dying to get there, but i have no car..
i am totally stranger in melb..
so, i just have to know how to get there by public transport..
it would be nice if you let know, thou..
i'm no local, so I looked on google maps for some clues, and my best guess is that you catch the train from the city, get off at fairfield station, and walk the rest. thank you so much for that..
i will try to get there on friday, then.. So my experience was definitely not a 20/20 but the food was delicious and the eggs i saw looked like they may be tasty. The coffee was good but not exceptional and the staff were friendly and fairly prompt but just not with my food. Would I go again? Probably, because it may have just been one of those days. Would I recommend it? If you haven't been to Mart 130, Circa, Replete, Amici's and the European then yes. Went to Apte for the first time yesterday, as per your recommendation. The place was packed, and we had to wait at least 10 minutes to sit on a crate outside, and then another 10 minutes for a table. The food took about half an hour to come out (a bit long in my book). I had the tasmanian salmon with the pea and feta fritter, which was tasty, and my husband had the eggs benedict with salmon but we still prefer the food at St Ali and the European. Not quite 20/20 for us. I really liked the food at APTE and the coffee wasn't bad. But one big turn off was the hot water oozing from my poached eggs when I sliced them open. Especially bad since it was a weekday and not too busy. Won't be heading back when melboune has so much goodness to offer. Just been to Apte where I had the big breakfast and the missus had the pancakes. Have to agree with the 20/20 rating! The big breakfast was not greasy (unlike many other places) and the service and atmosphere was great. I'm a local and never made it down there till now. It is a line ball decision between this and Mart 130 - Mart is a lot harder to get a table and not as family friendly. Checked it out today and we really enjoyed it. I had the big breakfast, my partner had the vegetarian breakfast. absolutely amazing soy latte's as well. and only 10 mins drive from ours! Went there with 2 friends last Saturday. 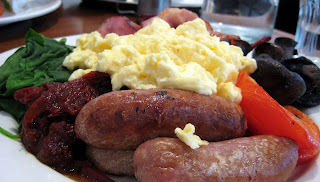 I had the big brekky, the others had the vege brekky and scrambled eggs on toast. Enjoyed the seating out the back. My first cappucino was truly excellent but the second one was too watery. I might not have noticed it so much if the first one hadn't been so good. I would consider going back but would try something else on the menu... there were some very interesting sounding non-standard alternatives to your regular brekky fair. So, all-in-all not hugely impressed unfortunately. I still prefer St Ali (whose coffee has never been less than perfect) and an eggs benedict at Veludo's in St Kilda. My husband and I recently received our copy of Delicious Magazine for February and were very excited to find that the National winner of the cafe of the year went to a Victorian cafe, apte. We had never heard of it and so did a little research on the net, which lead us to the breakfast blog website. It was even more surprising to find that they were the top cafe on this website too! So, last week we decided we had to go and check it out. Often, the hype surrounding a place with such high wraps is unjustified, but this was certainly not the case. Never have we been so impressed with a cafe and we can see why the votes for apte cafe in the Delicious Magazine cafe awards were so overwhelming. The food, coffee and service were all excellent. Even though they were busy, the staff were very friendly and attentive. It was so nice to be served by people that enjoy what they do and take pride in their work. The food was awesome and we will definately be back soon. My first visit to Apte after reading the view - the big breakfast has a nice combination; personally I prefer a more fluffy scramble but Apte's one is not bad. The bangers and mushroom are nice though. Then we tried the mix platter with banana bread and the ricotta pancake. The banana bread is interesting with crunchy texture thanks to the coconut. The pancake itself is not that tasty but the fruit compote and yoghurt give it a nice flavour. Coffee is great, OJ is nice. I love the garden setting, pity it is a bit too close to the road but nonetheless a good setting to have a nice weekend brunch. Definitely recommend to others. I completely agree with this review. Their vegetarian brekky is the best I've ever had and they are the most consistent coffee makers ever - consistently amazing!